Today, I’m posting some of my older artwork. The first, my Studio Muse, is one of my favorite pieces. I made this assemblage on my birthday in December of 2006, and gave myself the daunting challenge of creating a “studio muse” in one day! My friend Susan, an amazing artist, and my mother, Mary Jo, also an amazing artist and I spent the entire day creating art together. It’s funny how things turn out sometimes… I usually agonizingly over-think things and as a result hit multiple artistic roadblocks along the way. This time, however, with the one day self-imposed deadline, it relieved the pressure in my mind of creating some “great masterpiece”. I let the artwork evolve, created from my heart, and greatly enjoyed the day. As a result, Studio Muse is by far my favorite piece I’ve ever done. I didn’t quite finish the entire assemblage in one day, but did have the mat designed and planned out even though I had to complete it the final construction following day. It was my “best challenge” to myself, and I learned a lot through the process. Construction info: The base portrait is from a Botticelli painting. I attached silk and cotton fabrics, new fancy trims, vintage millinery leaves, dyed feathers and organza by sewing them in assembled units to a base of heavy interfacing. The inside background is a peach colored music print scrapbook paper covered with a layer of tulle. The mat was constructed using foam core board and a base layer of crackle textured wallpaper, accented with of torn pieces Gothic style script from an anaglypta wallpaper border. I filled in some of the cracks and the areas where the border was joined to the background with a lightweight spackling compound to suggest an ancient, deteriorating wall. The mat was then painted with several colors of gold and bronze fluid acrylics and antiqued. 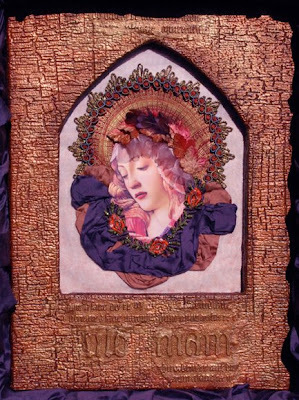 The shadowbox frame was painted gold, and the inside of the shadowbox was lined with the same eggplant silk used in the assemblage. An amazing peice of art... no wonder she is your muse!